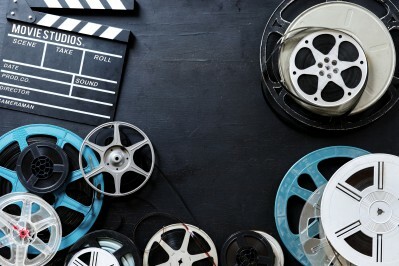 One of the most exciting parts of film marketing and promotions is that the industry embraces current trends, new technology and imaginative tactics. Stories about new movies may break in traditional press or by word of mouth, but it’s in the social sphere that massive hype really starts to build. These are a few of the films released in the past year that used social content to the fullest to create buzz leading up to and during their releases. Ever since the original Blair Witch Project, horror movies have been leaders of viral marketing campaigns. 2017’s IT made waves when they used a guerilla tactic to generate both awareness and user-generated content on social media. 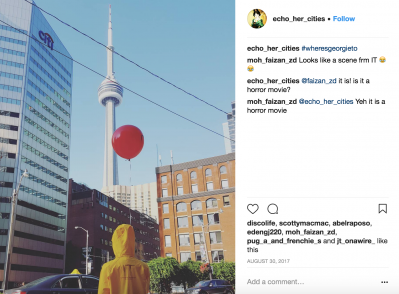 Iconic red balloons and mannequin children wearing yellow raincoats were placed in busy areas in major cities across the world. Not only is it a creepy, memorable thing to come across on your way to the office, but it’s also an iconic image that’s immediately relatable to the film. The campaign used localized hashtags to encourage and track sharing. #WheresGeorgieTO generated 506 unique pieces of content from Toronto passerbys and millions of impressions. Keeping on the theme of horror movie marketing, one of the simplest and most effective tactics Hereditary did to build its audience was to share all of the positive reviews it received early on, immediately positioning itself as the scariest film of the year. Not only did it share reviews from the press but also tweets from general audiences who were “shook,” “could not sleep” or ” disturbed” after watching the movie. There was interaction with fans, and critics’ reviews were backed up with real comments from “real people”. Hundreds of positive reviews from audiences can be worth just as much, or more, than one newspaper review. Things got a little bit too real for some movie-goers after a midnight screening in LA. Some of the screening attendees went home to find a creepy handmade doll, a hobby of one of the film’s characters, left on their doorstep. 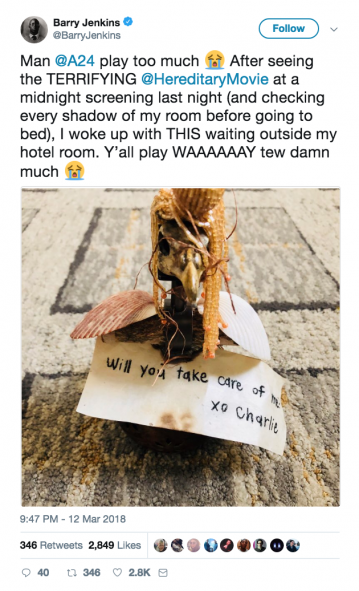 Not only did they surprise, delight, and terrify early supporters of the film, but they also set up and highly shareable moment knowing it would be a story worth telling to friends, family and co-workers the next day. The marketing team also managed to keep things light despite the incredibly dark tone of the film. 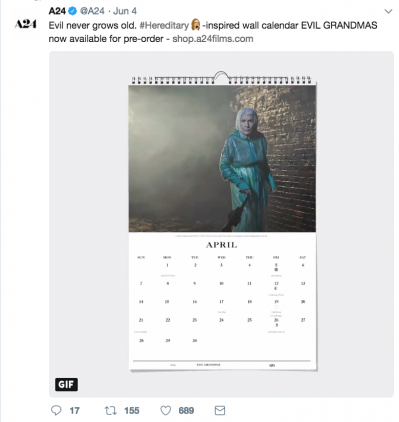 One of the only pieces of official merch you can get for the film is this Evil Grandmas calendar, inspired of course by the evil grandma in the film. The novelty was shared countless times by social users, bloggers and even news outlets. The sheer star power of the Jumanji reboot was the film’s biggest social media win. The lead ensemble, The Rock, Jack Black, Kevin Hart and Karen Gillan, all have massive social followings of their own. On Instagram, they’ve collectively accumulated over 172 million followers. Each one of them shared their own original content about the film including behind-the-scenes photos, press tour highlights, trailers and messages to fans encouraging them to see the film. Giving their stars a green light to share such content undoubtedly contributed to Jumanji‘s success as one of Sony’s top-grossing films of all time. And it cost them absolutely nothing to do. 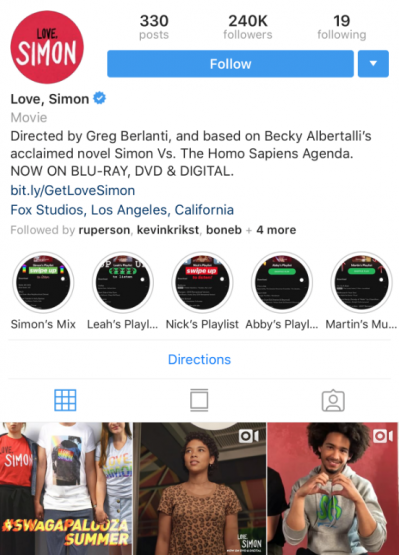 Love, Simon is a great example of a film that knew exactly who its audience was and how to reach them. In addition to creating custom, regular content for all of the major social feeds, there are two elements in particular that stood out as part of the release’s social campaign. The first was their use of Spotify, a platform often not considered as it isn’t technically a social platform. The film created custom playlists as if they were curated by the characters from the film, adding a fun bit of depth for fans to get to know them better. The second was their use of big-name influencers to promote and host special screenings of the film in their hometowns. Hannah Hart, Casie Neistat, Tyler Oakley and Gigi Gorgeous were among the film’s supporters. 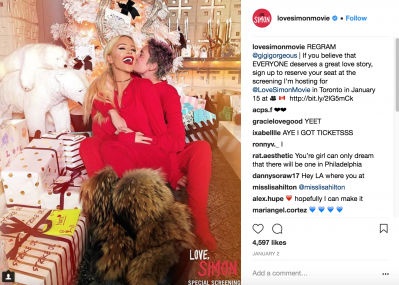 A second marketing push that followed the initial release saw celebrities buying out theatres in their hometown to give people a chance to see a beautiful LGBT film for free. Neil Patrick Harris, Matt Bomer, and Kristen Bell were a few to offer up the chance. Of course, no modern blog about social media marketing in film would be complete without mentioning Deadpool. Is there anything that the marketing team did that didn’t go viral? There have been entire articles on every post, stunt and video created for the sole purpose of promoting this movie online. 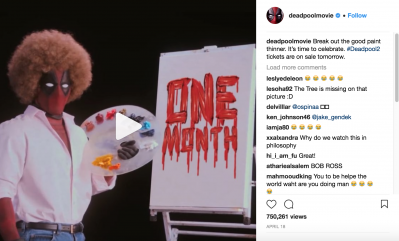 From drawing on popular trends and memes (like Bob Ross), to leveraging their star’s popular and quippy social accounts, to taking over Walmart’s DVD section, to producing multiple high-budget videos for the web, Deadpool dominated the web in the weeks leading up to its release. There was even a massive mural of Deadpool and the sequel’s lead villain painted in the style of The Creation of Adam, just steps from our office. It’s clear that the social marketing aspect of this film was a whole other production tied to the film, not something that was cobbled together from bits and pieces after it finished. One of the reasons they were able to be so successful is because they planned and created all of the elements they needed while the film was still in production. That meant that the production team, actors, marketing and PR team were working collectively for the best possible end result. Hype for films is created almost entirely online these days. Because of social media, an experiential pop-up, guerilla tactic or publicity stunt has life beyond its immediate audience. With so many people eager to share the out-of-the-ordinary, these campaigns can find secondary audience as social content. When these concepts become popular enough, even bloggers and news outlets begin picking them up as stories and campaign continues to snowball into something much bigger. Social media, PR and promotions are not entirely separate concepts. They work best when strategies are integrated, and these films have done an outstanding job doing just that. Touchwood PR is a full service publicity agency that specializes in arts and entertainment. Reach out to us about publicity, promotions, sponsorship, event planning, social media and more.